The image with this post is a studio mock up of a section of the coupon collection. I have been exploring various options for the future presentation of the collection. 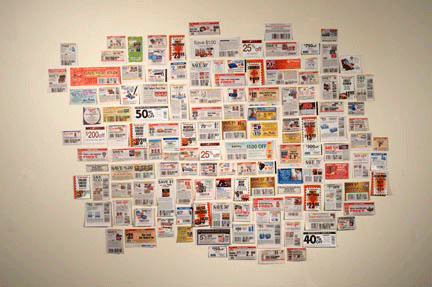 This grouping in the image is of the October expiration date coupons and 136 of 178 are being represented in the image. 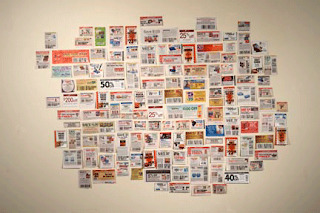 I have chosen to pin the coupons to the wall for display, by not framing them or of other archival means of display alludes to a semi-precious context as well as the potential of continual accumulation of the collection. The coupons are originally collected for temporary use in the role of economic exchange in consumption. The expiration date is the finalizing point of the social interaction between the person and the coupon. My objective with the coupon collection is to visually represent the integration of the print media culture and an aspect of the consumption process. The print media culture’s longevity will also be questioned with a continual emergence of digital coupons. These topics will be explored in greater detail with my essay that will accompany the coupon collection. There are 19 additions to the Mouth Collection, which have been updated on my website. The addition totals for the coupon collection have also been updated. In the New Year I will be posting more on the essay, additions to the collections, along with new collections.